Füsun Onur, Counterpoint with Flowers, (1982) 2014. 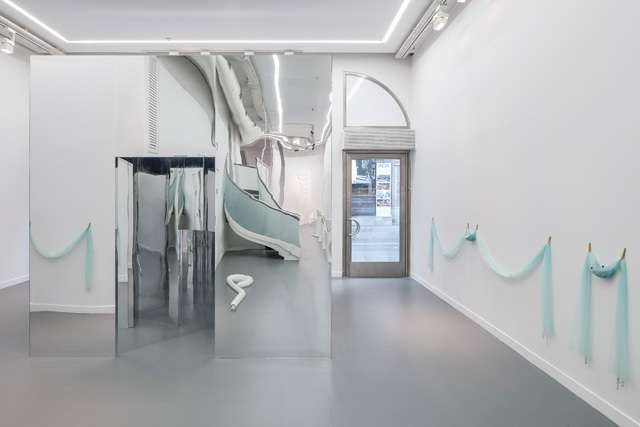 Installation view: ARTER, 2014. Photo: Murat Germen. İz Öztat: You have been suspicious of texts that accompany the artworks and reveal the artist’s intentions. In your own writing, you emphasize the creativity of the audience. In the text that accompanied your exhibition Counterpoint with Flowers (1982) at Taksim Art Gallery, you write “If the viewer participates creatively without prejudice with what s/he sees at that moment, discovers the internal connections and moves beyond rooted habits, then the flow, timelessnesses, continuities, extensions and contractions and the void could change and be shaped differently by each spectator.” In the recordings of your artist talk that took place in 1987 in the occasion of your exhibition, Sign of The Sign, at Maçka Sanat Galerisi, you say “The artwork ends with the explanation of the artist.” Did your opinion on the topic change over the years? Füsun Onur: I preferred to do so mostly because I wanted to leave room for the audience and to multiply the meaning. I make the work thinking of something, the audience thinks of something else. However, when I went to Germany in the 1990’s, they wanted explanations and so I started to write what I was thinking of as I made the work. I also wrote before then; for instance on the exhibitions at Taksim Art Gallery… The viewer comes and definitely wants information about what s/he sees. There, three different exhibitions would take place simultaneously. For example, an artist made a tree in the exhibition upstairs and says “The tree somewhere on the island.” The spectator asks, “I haven’t seen such a tree. How did you make this?” So I put a text titled Sign of The Sign. I had an exhibition titled People at the Gallery, People in the Market, Others. For People at the Gallery, there were flashy labels in frames, people were looking only at the title. For People in the Market, there were fresh vegetables in crates. For Others, I put woods and sprinkled them with water, Others were dogs. In the text, I referred to things that are routine for people; people wake up with the alarm clock, the telephone rings… They always move with stimulations. I wrote that the imagery of thinking is not used. I am not affiliated with a doctrine or theory. Since I work by following myself, I move towards the future when I finish. I don’t think about what I have done. 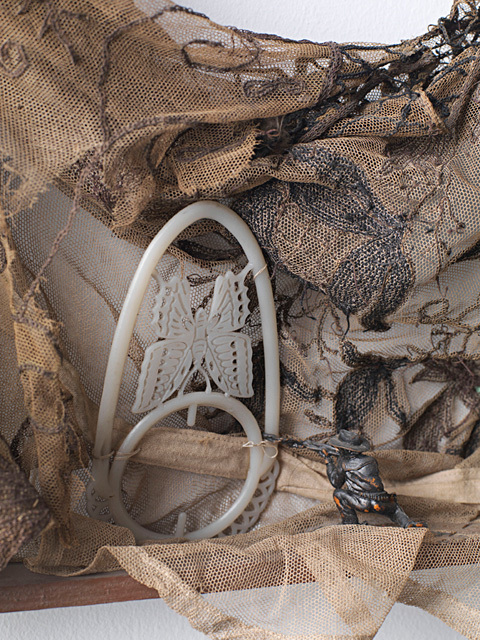 Füsun Onur, Pegged, 2014, Wire, peg. Installation view from Through the Looking Glass, ARTER, 2014. Photo: Murat Germen. İÖ: Have there been situations, in which you learned something about the work from the audience’s response? FO: There were people saying, “If you make art like this, the general public will not get it.” I never felt something like that. Taksim Art Gallery was frequented by people who stopped by on the way to work, young people, and students. I never forget; one day a lady came in. It was a rainy day, she was carrying a shopping bag. I thought she came in to rest. She approached me and said, “I saw your name. Your previous exhibition made me think. I came to see what you came up with this time.” I was very pleased. But people, who go abroad and come back, want to see exactly what they saw abroad. Yet, they look down on it when they see the same thing here first. If you are sincere; if you really devote your heart, mind and yourself, it is comprehended. İÖ: I will go back to your artist talk at Maçka Sanat Galerisi again, where you say, “Artists, who can communicate with each other in a meta-language, come together very rarely. We don’t discuss, we are disconnected. I think this might create a decoupling in the arts in Turkey.” Did this anxiety evaporate over the years? Or, do you think the same situation persists? FO: I don’t know what the youth is up to. I feel like the youth comes together more often. They form groups. There wasn’t much of this back in our time. Maybe, I was distanced because I live far away. Everybody has to be alone when they are working but speaking about it later… These artist talks took place in Rabia (Çapa) Hanım’s every exhibition. 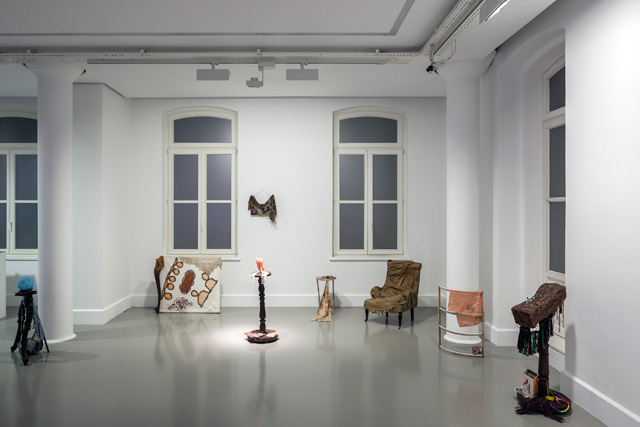 İÖ: Your exhibition at ARTER references Lewis Carroll’s Through the Looking Glass, which is a continuation of Alice in Wonderland that you use as part of a work in Life-Art-Fiction, Dream of Old Furniture exhibition at Taksim Art Gallery in 1985. In her text written for your monograph, For Careful Eyes, published by YKY in 2007, Margrit Brehm suggests that you invite the viewers like Alice “to listen to the secret dialogue between things, to invent stories themselves.” With the title and installation of your exhibition at ARTER, this reference and the suggestion of entering another dimension through your works are further underlined. 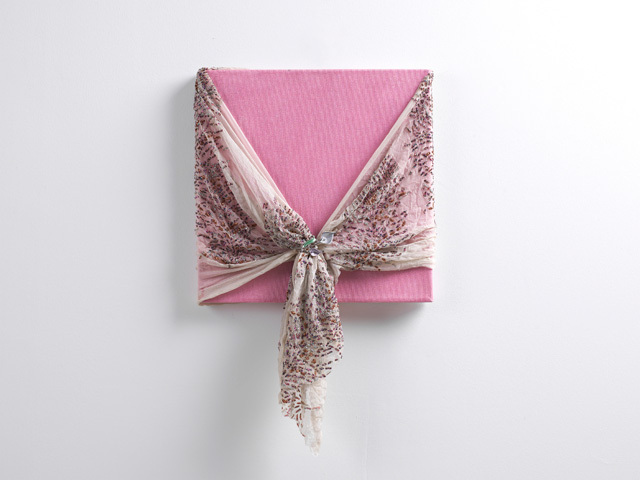 Füsun Onur, Elegy for Tekir, 2009-2012. Installation view from Through the Looking Glass, ARTER, 2014. Photo: Murat Germen. İÖ: I want to ask a few questions about the works that are not talked about in the previous interviews you have given. I will ask about Musical Chair. Have you painted the feet on the floor as they would be seen from a cat’s perspective? FÖ: They are depicted as if someone sat there and left but her feet; her trace, has remained. For group exhibitions, I get a fantastic idea and make a small work. 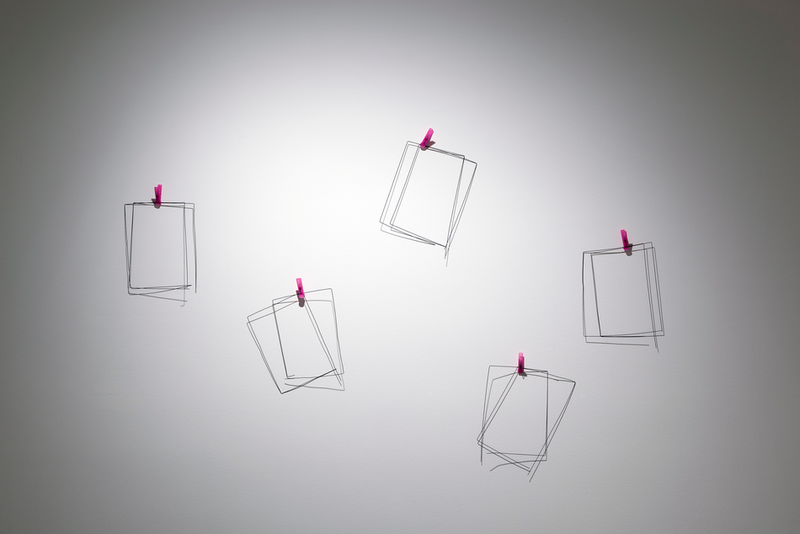 İÖ: On the 170th page of the book that is published along with your exhibition, Through the Looking Glass, we see a text. Is this your graduate degree thesis completed at Maryland Institute in 1967? FÖ: Yes, it is my thesis from the USA. The photographs of the sculpture aren’t good. They were taken in one night. A photography student used to take the photographs and his camera broke. There was another lady. She said, “If you take care of my child tonight, I will take the photographs for you.” She took the photographs and printed them in a single night, then we were able to have the jury. Füsun Onur, War through the Eyes of a Child, 1994. Table, photographs, boot, doll, baby dress. 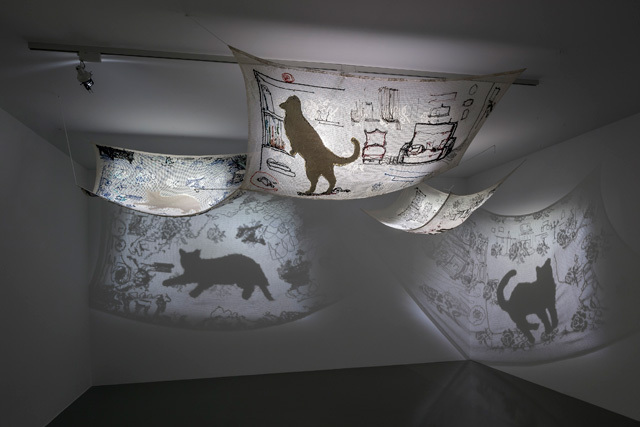 Installation view from Through the Looking Glass, ARTER, 2014. Photo: Murat Germen. İÖ: Did you leave all of these sculptures there? FÖ: My friends took them. Only this one was left. There was somebody cleaning the studio. He would come every evening to clean and I would make a mess again the next morning. I was working with plaster. I was thinking that he should be mad at me. He asked, “Will you sell this sculpture to me? I will take it with my pushcart and I have a closed space to place it in my garden.” And I said, “I was so upset that you had to clean up after my process.” I gave the sculpture to him and he was very happy. Füsun Onur, Through the Looking Glass, 2014. 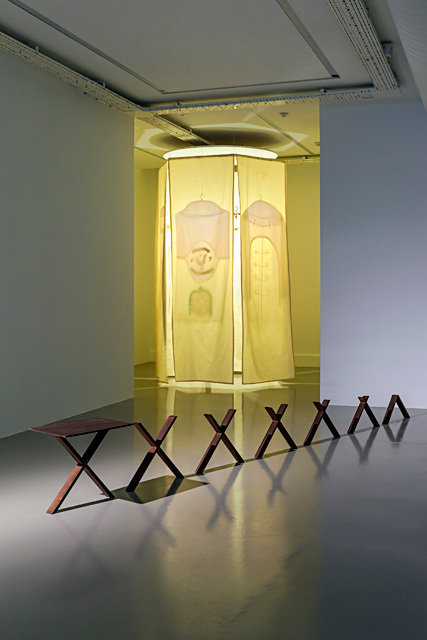 Installation view: Whisper, 2010; Istanbul Obsession, 1994. Photo: Murat Germen. İÖ: In many of your works, you treat the material in a way that emphasizes the transience of the artwork, rather than its permanence. When you were asked what you do with your works after the exhibitions, you answer, “When it became too crowded in the studio, I took a good picture and threw them in the sea.” What are your reflections after this exhibition, for which some of your works were reproduced? FÖ: Of course, I got excited about their reproduction and seeing them again… This was not possible, they were all gone. It was necessary to throw them away to be able to make new ones in the studio. The studio was filling up, I needed to make room. I was also having to dust them off, to take care of them. I was done with the works anyway, the moment I made them. To exhibit them here is something else. They are all together! Emre (Baykal) installed them like music with a rhythm. Seeing them all together is something else. I didn’t have the space or the time to deal with each one of them. The excitement disappears when the exhibition ends anyways. I didn’t even look at them much in the exhibition, once I brought them there. Füsun Onur, Through the Looking Glass, 2014. 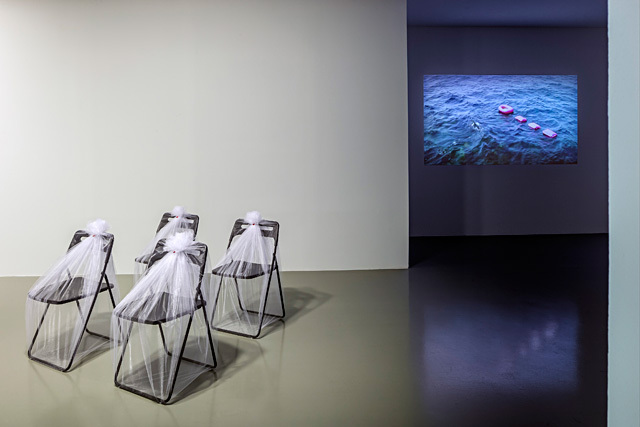 Installation view: Any Chair (1991) 2014; Pink Boat, 2014 (sketch: 1993). Photo: Murat Germen. İÖ: Untitled (Shapeless Form), which you produced for Biennale of Young Artists in Paris (1972) was inflated by the audience with a pump. In the reproduced version, it inflates and deflates by itself. İÖ: So is it appropriate for you to transform the work with the advanced technology and diversified materials? Füsun Onur, Pink Boat, 2014 (sketch: 1993). Video, 8 hours. Video still. İÖ: And there are also works in the exhibition, which you made sketches for but could not realize; Mirrored Labyrinth, 2014 (model: 1972) and Pink Boat, 2014 (sketch: 1993). 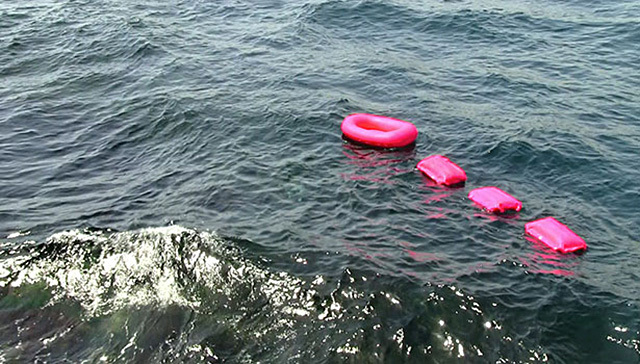 Were you thinking of installing the pink boat on the sea in front of your house? On the sketch, you write “Galata Bridge”. FÖ: It was supposed to be placed by Galata Bridge. When we heard that the Galata Bridge was going to be removed, a few artists thought of producing works to be placed there. We were upset that it was going to disappear and thought we could have an impact… This is what I made but someone came and told me that the bridge has already been removed. Füsun Onur, Through the Looking Glass, 2014. Exhibition view. On the left: Mirrored Labyrinth, 2014 (model: 1972). On the right: Those Who Have Washed Here, 1994. Photo: Murat Germen. İÖ: In the recent years, historical heritage of Istanbul and the environment is being destroyed rapidly. How do you feel? FÖ: Yes, we shot here for eight hours. The exhibition opens at 11:00 and we also started recording here at 11:00. It will be shown within the same timeframe. İÖ: I also want to ask about the doll house that you made in the 1970s. Did you make it as an artwork? Has it been shown before? İÖ: Have you ever exhibited the house? FO: No, I am showing it for the first time. İlhan Onur: (Füsun Onur’s sister) Actually, Füsun was playing and I insisted on putting them in a house and keeping them. I made the box and she carefully placed them inside. Otherwise, she makes and throws away. Füsun Onur, From an Exhibition, 1989. Canvas, wood, gauze, gilding, paint, thread, 66 x 59 cm. Photo: Hadiye Cangökçe. İÖ: In the conversation with Carolyn Christov-Bakargiev and Hans Ulrich Obrist that was in the book published simultaneously with dOCUMENTA(13), you say, “I forget, İlhan remembers and asks.” I guess İlhan Hanım plays an important role in the documentation and preservation of the works. İÖ: I also want to ask a question about your house. In the publications that came out in the last few years, your house is always mentioned and it is becoming part of the narrative that surrounds your practice. Is the significance of the house attributed by people who visit the house, or is this also significant for you? FO: We don’t realize this because we are inside of it. People, who come, say that we are merged with the house. Also, we are fond of memories. As time passes, we didn’t get tired of what our mother and father had purchased; we didn’t want to replace these objects with new ones. We are happy with them. We now pay attention and think about where to hang and place what. 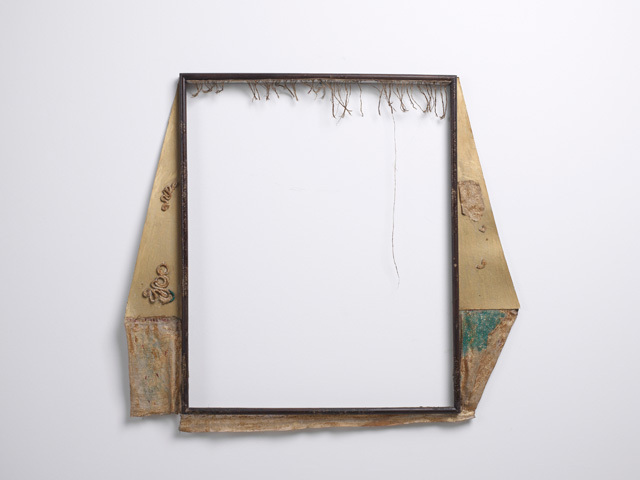 Füsun Onur, Dream of Old Furniture, 1985. Installation view from Through the Looking Glass, ARTER, 2014. Vehbi Koç Foundation Contemporary Art Collection. Photo: Murat Germen. FO: I collected and took them from friends specifically for the work. There is something with a blue ball on top of it. I said, “Let’s look at antique stores to find this piece.” İlhan replied, “How are we going to find what you drew?” We went to the store. They had the good pieces upstairs and the scrap pieces downstairs. They suggested that we go down and take a look. I found exactly what I sketched. You find what you really want. FO: The material comes with the work as I am imagining it. A material that I don’t like and never considered comes with the work. Installation (detail). Vehbi Koç Foundation Contemporary Art Collection. Photo: Hadiye Cangökçe. FO: In Dolmabahçe Souvenir, the chairs and the columns were from Dolmabahçe. I only brought the pumpkins and the plastic. İÖ: You didn’t show that work again, right? FO: It was a site-specific work. İÖ: I have a question concerning site-specificity. 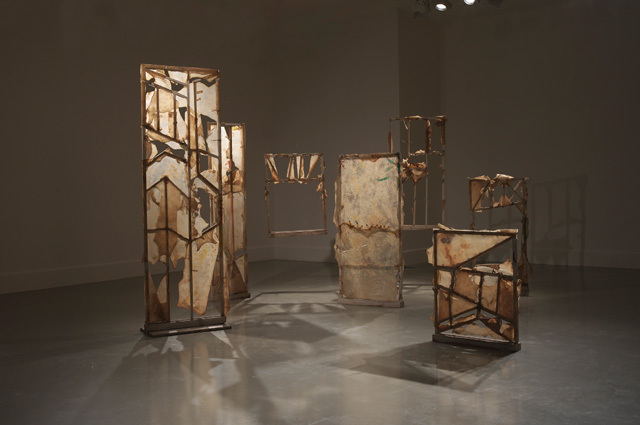 Untitled (Variation) (1976) 2014, which is shown at the ground floor of ARTER was first shown in the garden of the Archeology Museum as a sequence of four column-like structures with opening forms on top of them. Did you create this work in relation to the architecture of the Archeology Museum? When shown in a different location, does the meaning of the work change? FÖ: Its meaning doesn’t change. I made that work because there was a large space there, not because it is the Archeology Museum. What I wanted to do was; viewers pass by a painting or sculpture. When installed this way, they first encounter one, move to the next and the next one, staying maybe a second or a minute by each work. I articulated a duration by creating modules. The arrows there point to the next one and the form opens up eventually. İÖ: It actually predates the works that come later, which are concerned with creating their own rhythm. FO: I realized it when I was writing to Margrit Brehm. For Counterpoint with Flowers, I have used a term borrowed from music. I didn’t notice it then and saw it when I was going through the works. I must have been thinking about this even then. Füsun Onur, Counterpoint with Flowers, (1982) 2014. 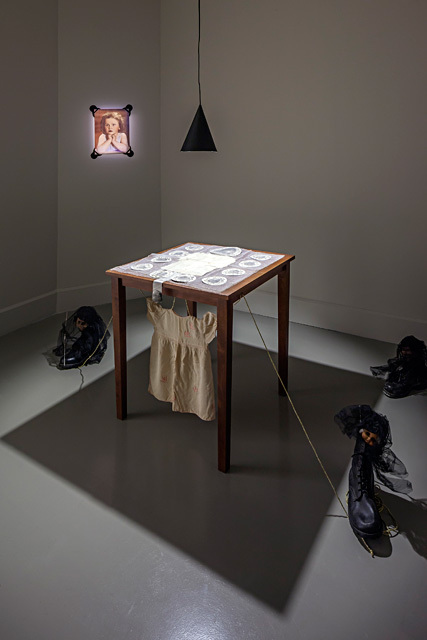 Installation view from Through the Looking Glass, ARTER, 2014. Photo: Murat Germen. İÖ: You are also showing Counterpoint with Flowers for the first time since its first installation. FO: Yes, it came apart after a while. And then, it was thrown away of course. İÖ: Did you reproduce the objects that make up the work? FO: Yes, I made little models of them. Deniz (artist’s assistant Deniz Duygu Vural) made larger ones by consulting me. We didn’t have the strings for Third Dimension in Painting / Come in either… We also made it a little larger. Also, for the previous installation, we dyed the strings at home with powder fabric dyes. Now, it is neat. İÖ: In the previously published interviews, you mention being asked if you want to stay in the United States after completing your graduate degree. You answer, “I want to go back to my country, I want to be useful.” Do you think you have been useful; to Turkey and to the artistic scene in Turkey? FO: I didn’t think I was but people say “You have been useful.” So many young people came to this exhibition. This means I have been. They used to say, “The youth appreciates you.” I couldn’t believe it because they didn’t see, they only knew the work through photographs, which might not have been comprehensible. Füsun Onur, Icons of Time, 1990. Installation, 7 pieces: Wood, leather, metal, paint. Photo: Hadiye Cangökçe. İÖ: In the 1970s, in an environment where the academy is a determining authority, you are one of the few artists, who work with different materials and you never compromise. FO: I can’t help it, I did what I wanted to do. I exhibit the work. They can push it away. Nothing happens to me. İÖ: You just said, “Some works are not comprehensible in the photographs.” I have seen photographs of your Untitled oil painting, on which you write “LOVE YOUR HAIR IN THE YEAR OF CHILDREN 1979” but when I saw the actual work in the exhibition, I was able to spend more time with it. FO: That statement is an allusion. In the advertisements, they used such slogans… Some children are brought up like race horses. They had to prepare for exams then. Yet, most of the children are left among the waves. They struggle and try not to get lost. İÖ: Did you make this work for an exhibition? FÖ: There was a group exhibition titled Çocuk Yılı [Year of Children]. Everybody made a work about children. İÖ: How do you feel after seeing many works from different periods exhibited together? Does it invite new ideas about what might come next? FO: I didn’t think about what comes after. Now, I am enjoying this. This interview was published in the July-August issue of Sanat Dünyamız in Turkish. 57 x 35 cm. Photo: Hadiye Cangökçe. İz Öztat (1981) lives and works in Istanbul. She completed her BA degree in visual arts with honors at Oberlin College, Ohio and her MA degree in visual arts and communication at Sabancı University, İstanbul. She is currently a candidate for PhD in Art Practice at Yıldız Technical University, İstanbul. 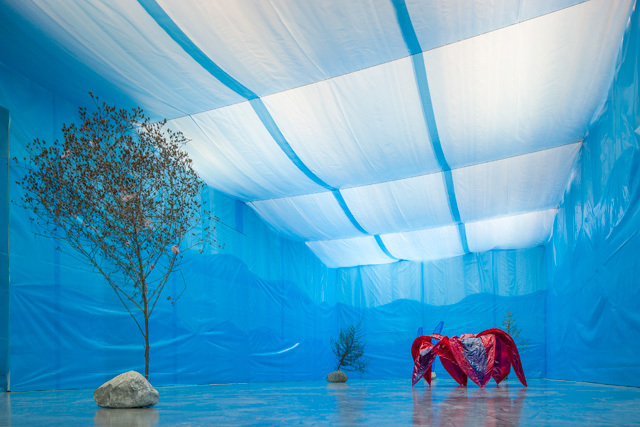 Her selected exhibitions include ‘Conducted in depth and projected at length’, Heidelberger Kunstverein, Germany (2014), ‘Rendez-vous 13′, Institut d’art Contemporain, Lyon, France (2013), ‘Here Together Now’, Matadero Madrid (2013), ‘I am not dealing with triangle, square and circle’, Maçka Sanat Galerisi, Istanbul (2012), ‘Underconstruction’, Apartment Project Berlin (2012), ‘Second Exhibition’, ARTER, Istanbul (2010). Posted in content, on artists and tagged Any Chair, Arter, Counterpoint with Flowers, Dream of Old Furniture, Elegy for Tekir, Emre Baykal, Füsun Onur, Flamboyant, From an Exhibition, Icons of Time, Istanbul Obsession, Lewis Carroll, Mirrored Labyrinth, Pegged, Pink Boat, Those Who Have Washed Here, Through the Looking Glass, War through the Eyes of a Child, Whisper, İz Öztat. Bookmark the permalink.